Mundgod, Karnataka, India, 17 dicembre 2017 – An estimated eight thousand people, almost entirely Tibetans and people from the Himalayan regions, gathered to listen to His Holiness the Dalai Lama teach this morning. Monks filled the assembly halls of both Ganden Lachi and Ganden Shartse Monasteries, while the remainder of the crowd spilled out onto the yard outside. Large video displays and towers of loudspeakers allowed them to remain in touch with what was going on inside. His Holiness took the stairs from his apartment down to the temple where he paid his respects before the enshrined images and greeted the distinguished Lamas before ascending the throne. “Our original plans changed because I caught a cold,” His Holiness explained. “I was tired after the ordinations in Drepung, but today, after a day’s rest, I feel better. “Ganden is the mother monastery of our tradition, founded by Je Tsongkhapa, which Gyalwa Gendun Drup described so well in his ‘Song of the Eastern Snow Mountain’. White clouds float high in the sky. There comes to me a vision of my teachers. Again and again am I moved by faith. Lies the illustrious Ganden Monastery, Hermitage of Joy. My spiritual father Lobsang Drakpa, and his two chief disciples. On the yogas of the path’s two stages. Your kindness, O masters, transcends thought. “Je Rinpoche http://www.sangye.it/altro/?cat=22 was one of the greatest personalities to serve Buddhism in the Land of Snow. A Japanese scholar once told me he felt that reading what Je Rinpoche wrote you can tell the kind of person he was. “Having come here to Ganden I decided to give this teaching so I won’t have visited without doing anything constructive. His Holiness remarked that the tradition of studying the classic texts and great treatises was upheld by all Tibetan Buddhist Traditions, each of which also engaged in the application of epistemology and logic. He noted that while the Nalanda Tradition was influential in both China and Tibet, Dignaga’s and Dharmakirti’s major works on logic are all available in Tibetan, whereas only one small text of Dharmakirti’s was translated into Chinese. Early Sakya scholars Kunga Nyingpo, Drogon Chögyal Phagpa and Sakya Pandita paid particular attention to the rules and function of logic. Rendawa was an heir to that tradition. He was among several superb scholars who deeply influenced Je Rinpoche. Another was Lhodrak Namkha Gyaltsen who gave him instructions in Dzogchen. His Holiness commended Tsongkhapa not only for being learned in many fields, but for applying what he learned in practice. This pattern of study and practice was maintained at the Three Seats of Learning around Lhasa—Ganden, Sera and Drepung—and Tashi Lhunpo. “Here in exile we have kept up this tradition and now nuns too have taken up rigorous studies. The determination of the people of Tibet serves as a constant source of encouragement. The tradition we uphold is the pure tradition of Nalanda—I urge all of you to continue to keep it up. His Holiness explained that this text begins with an appreciation of the difficulty of finding human life and the importance of turning away attraction to this life. He remarked that this is different from the approach of the ‘Foundation of All Excellence’ that more closely follows the pattern of Atisha’s ‘Lamp for the Path’. He digressed to mention that 3 or 4 years ago a Chinese scholar from Columbia University told him that he had explored Chinese historical documents. They reveal the existence of three empires—Tibetan, Mongolian and Chinese—as well as the fact that from the T’ang to the Qing dynasty—the Manchus who ruled at the time of the 13th Dalai Lama—there was no mention at all of Tibet being a part of China. What is also clear is that after Shantarakshita helped set up Samye Monastery, there were Chinese monks in the Department of Unwavering Concentration. In due course, Kamalashila, Shantarakshita’s disciple, came to debate with them. By the 11th century King Jangchub Ö was so concerned by the decline of Buddhist traditions in Tibet that he requested Atisha to compose a text to restore them. The result was the ‘Lamp for the Path’. 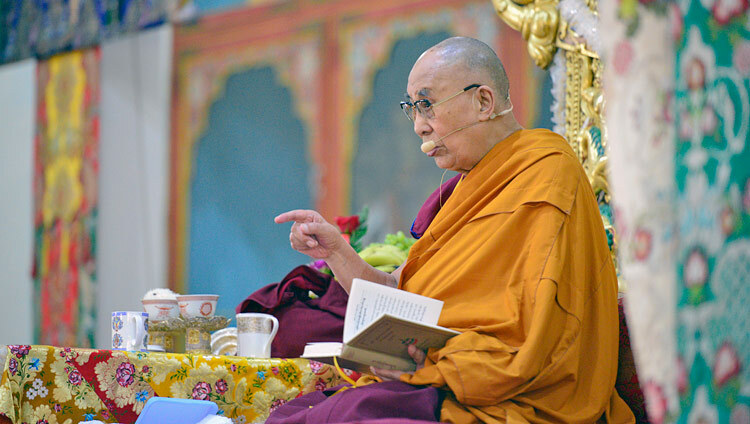 His Holiness explained that that text, and other subsequent Stages of the Path texts, begin with the need to rely on a Guru or spiritual mentor. His Holiness feels strongly that it’s more appropriate now to follow the approach of ‘Ornament for Clear Realization’, which starts by introducing the Two Truths, the Four Noble Truths and the qualities of the Three Jewels. Later prevent views of all kinds. Whoever knows of this is wise. All comes from desiring myself to be happy. I, an unborn yogi of space. represent the Consequentialist Middle Way (Prasangika-Madhyamaka) view, which also asserts that things exist merely by way of designation. He concluded with the comment that this short text presents the very essence of the Buddha’s teaching. He recommended that his listeners build on it by carefully scrutinizing particularly what Je Rinpoche has to say in his treatises on the Middle Way View. 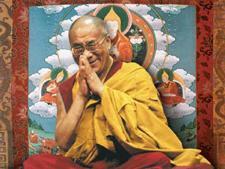 His Holiness is due to leave Mundgod tomorrow for a two day journey by road to the Tibetan Settlement of Bylakuppe.